Professional baseball player William “Rasty” Wright didn’t make much of an impact in the big leagues, playing for two teams in one year before returning to the minors. He was hardly a terrible player: he could hit well and get on base, and was likely the first minor-league player to reach 2,000 career hits. But his fielding was questionable and, moreover, he was fond of starting heated arguments. He played just one season of professional baseball in the Zenith City, and that was cut short when the league dropped the Duluth squad from its circuit. After Wright retired, he soon found himself on the run from the law—and back in Duluth. This time he was in the Zenith City to stay, working a different game, one in which he rarely played himself—but often paid a penalty for losing. William Smith Wright was born on January 31, 1863, in Birmingham, Michigan, one of four children of Aaron and Laura Wright. 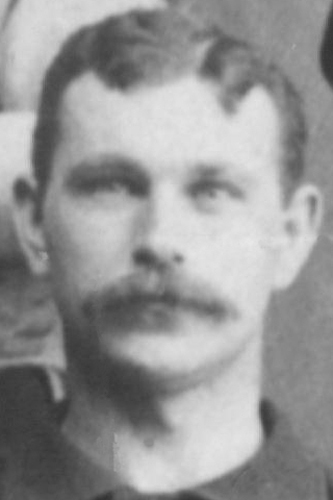 After playing for his home town amateur team and then a Detroit semi-pro team, he joined a professional team in Muskegon in 1884, playing in the Northwestern League. After that, Wright bounced around the minor leagues for nearly two decades. He wasn’t exactly a star, but an 1890 article about Wright describes him as the type of player the modern Oakland Athletics might go after using their “Moneyball” approach if he were around today: “Wright is not a great fielder, but gets his bases on balls as often as any man in the Association. Aside from this, he is a hard hitter.” This mixed bag of talent kept Wright traveling from team to team. From Toledo to Buffalo, Wright played on over a dozen squads from 1884 until he retired in 1899, stepping on some toes along the way. The following year found Wright right here in the Zenith City, but the Duluth team—along with Wright—were dropped from the league after it reorganized in August. When he ended up in Los Angles the following year, the local press described him as a Boy Scout: “Wright is a great batter,” the Los Angeles Herald proclaimed. “He never drinks or uses tobacco. Altogether, Wright is a model player, and will aid materially in landing the flag for Los Angeles.” Los Angeles team did indeed when its league’s pennant that year, but Wright also proved the Herald wrong: That same year Wright found himself at the center of trouble off the diamond. Apparently Wright augmented his income by running a poker game in a private room, and an argument during a game led to a running gun battle. By May 1899 Wright was in New Jersey acting as the player-manager of the Paterson Giants. After a game in May Wright had collected the Giants’ share of the game receipts without the owner’s knowledge—and he refused to give the money back. Wright was released, and he concluded his career playing for Buffalo for one week in June. In 1,454 minor-league games, Wright had a career batting average of .351 and accumulated 2,111 hits, 1,655 runs, 336 doubles, 137 triples, 42 home runs and 388 stolen bases. Following his baseball career Wright returned to Michigan and attempted to obtain the single saloon license issued by the city of Sparta. As an incentive, Wright offered to bring a baseball club to the town, but city fathers were more interested in a hotel and opera house. In December 1903 Wright once again found trouble while running a poker game in Grand Rapids. Wright had set up the “Atlas Club” above a saloon, and one disgruntled player who had lost $250 there sued to get it back. Because of a prior offense, Wright faced imprisonment if convicted, so he skipped town. Wright’s legal woes mounted in the Zenith City. On December 2, 1909, he was found guilty of “conducting a gambling establishment” and paid a $100 fine in order to avoid 60 days in jail. He was arrested May 4, 1910, in his room at Duluth’s Lincoln Hotel at 321 West Third Street for having “gambling paraphernalia, namely poker chips and cards, in his possession.” Again he posted $100 bail and was arraigned the following morning. One notorious episode in Wright’s Duluth career reads like the scene from The Sopranos. In the early morning of February 13, 1921, a crap game at Wright’s apartment at 224 West Third Street was interrupted when an unwelcome guest—wearing a handkerchief over his face and a wig on his head—entered the room, pulled a gun, and robbed the 15 players gathered there. Reports initially indicated that $2,000 worth of cash and jewelry was stolen, but that number was later adjusted to $400. The robber fired three shots during the incident, two at fleeing participants who presumably thought the robbery was a police raid. The third struck the floorboards near Wright’s feet—he had not moved fast enough when the gunman demanded he put his hands up and face the wall. Duluth plain clothes officers later stopped known gamblers on the street and asked for the time; nine who could not produce their pocket watches were suspected of being among the victims and booked on gambling charges. Wright was arrested for keeping a gambling place, the final time he would see the inside of a jail cell. He died at his home from a cerebral hemorrhage on October 14, 1922. He was 59 years old.